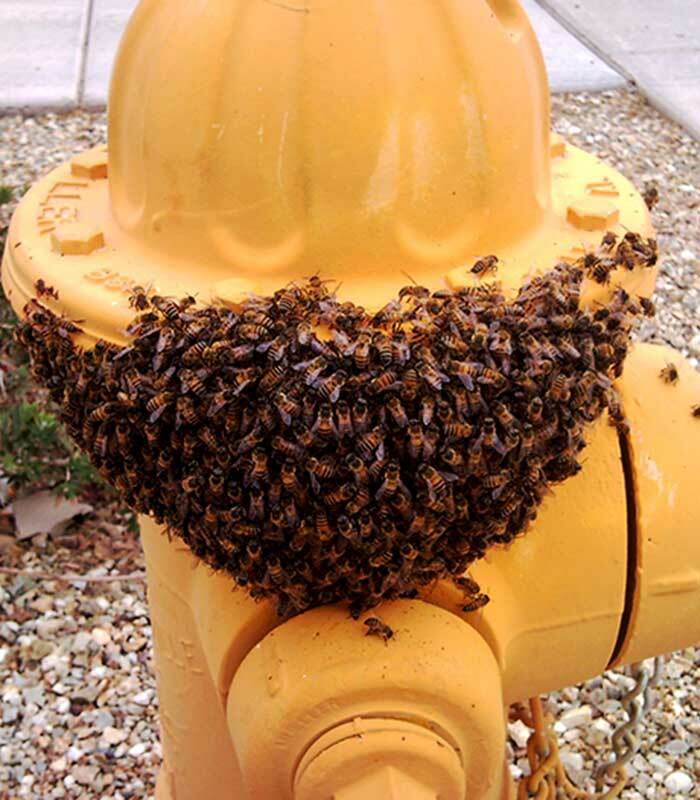 Once honey bees in Arizona have established themselves on your property. 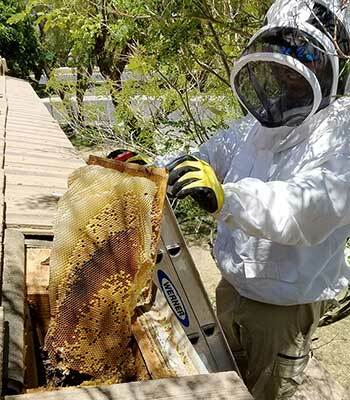 Honeycomb removal becomes necessary to prevent property damage as well as robber bees returning to the area due to pheromones and honey left from the previous colony. Honey left in an attic space or wall of a home can cause a lot of damage and also become a health and fire hazard. During the hot Arizona summer months where temps exceed 100 degrees in Phoenix. Honey melts and flows like water and can cause serious damage to your property. Mold from the decaying bees and honey can become a health hazard and also bring in other unwanted pests such as cockroaches, ants, mice, and rats to name a few. 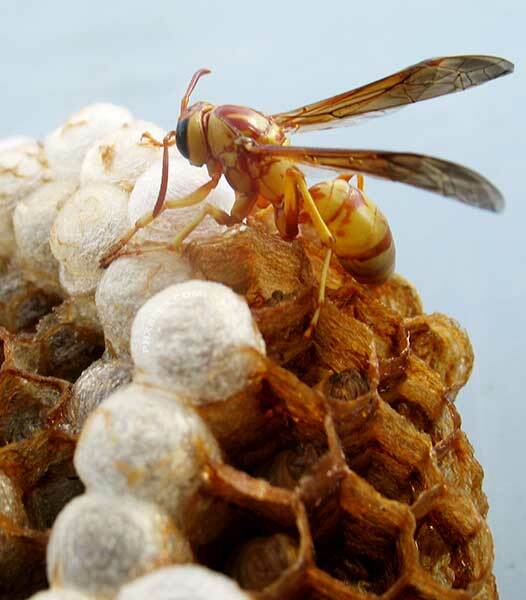 Other colonies of bees will also be drawn to the pheromones left behind by the bees and honeycomb and move back into the area and this will become a reoccurring problem. Not only do we provide the honeycomb removal service but repairing and sealing off the infested area is included in the price. Along with a 3-year warranty on the area serviced. We will fill in the void preventing the bees from ever gaining access again. We always recommend having the honeycomb removed to prevent property damage and other potential problems. If the honey and bees are left in the problem area you will have a continuous issue with bees a couple times a year due to the pheromones attracting foraging bees and migrating swarms. Rodents, roaches, ants, and other pests will also be attracted to the leftover honey and will also become an issue. Feel free to give us a call and get a free quote over the phone for your honeycomb removal and repair service. 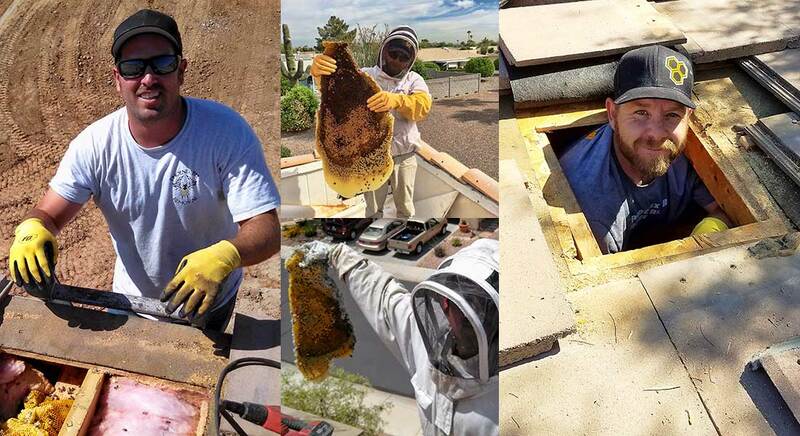 From start to finish Phoenix Bee Removal LLC. is here to help with any honeycomb removal issues you may encounter and to answer any questions you may have about the honeycomb removal and repair process. 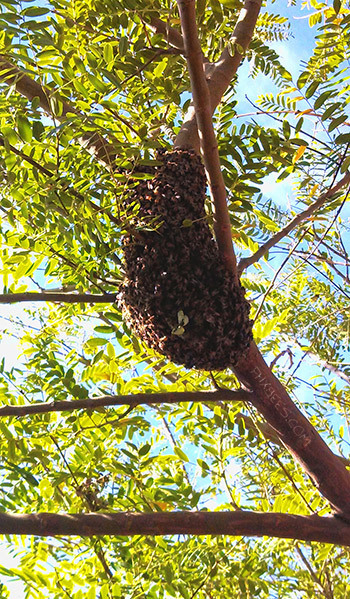 Almost all of the "beehives" you see in trees are just migrating swarms that look like a beehive once they are all huddled up around the Queen Bee. These migrating swarms will move on without needing any human interference. The typical time a honey bee swarm will stick around is about 2-3 days. 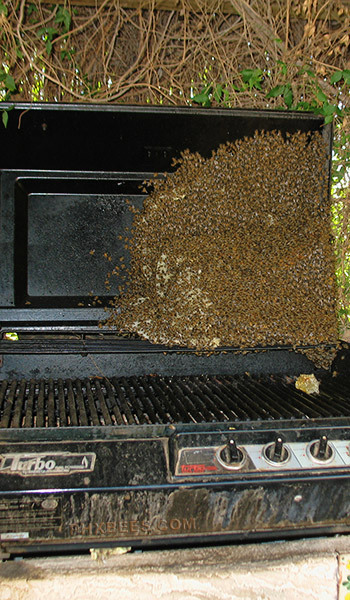 Sometimes the bees are gone within hours of showing up. If you encounter a bee swarm in a tree please give them a chance to leave naturally. There are times that the bees will decide to stay. The tree the bees are in might be able to provide an abundant amount of cover keeping the bees protected from the elements. In these rare cases, you will need to have the bees either treated or relocated depending on the situation. Some rare occasions bees will start building a hive in a tree and in these instances, the bees and honeycomb will need to be removed. A natural spot for Honey Bees is inside the hollow of a tree branch or root system of a tree. Bees inside the roots of Olive trees or bees inside the hollows of Mulberry trees happen quite often in Arizona. The Phoenix area doesn't have a lot when it comes to the selection of trees but the bees make due with what we have and actually thrive during the Spring and Summer months. Honeycomb removal from the inside of trees is not normally possible unless the tree is dead or is being cut down. Bees can enter the attic space of a home through the ventilation blocks or cracks and gaps in the blocking. Once inside of an attic the bees can begin to establish a hive rapidly and begin making honeycomb immediately. Then the queen bee will then start producing offspring to grow the bee colony to produce more honey and keep the hive safe from any threats. The bees may also choose to keep the beehive on the exterior of the home we call this an open-air hive and they can often become dangerous. Bees like to make their hives in areas with as little traffic and noise as possible and can sometimes go unnoticed for weeks or even months at a time. Once the bees become established they will protect their home just like we would. 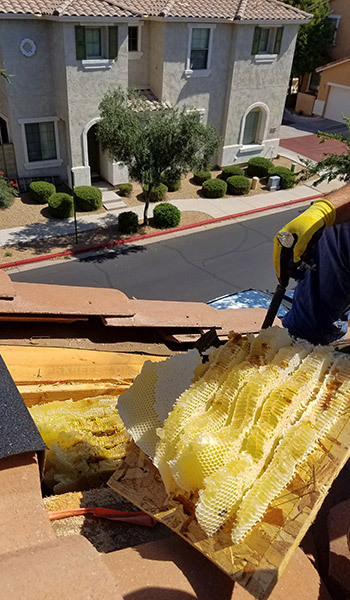 Honeycomb removal from these areas can be tricky as we have a wide variation of buildings in the Phoenix Metro area. This is one of the most common spots to find a feral bee colony. 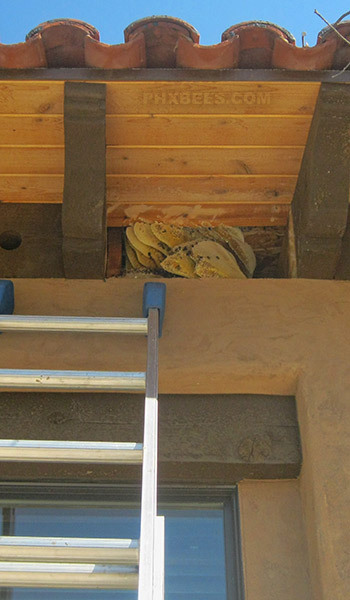 Bees can enter through openings in the flashing along the bottom of stucco walls/pop-outs/window seats etc. all are very common spots to find entry points to empty voids inside of your walls. 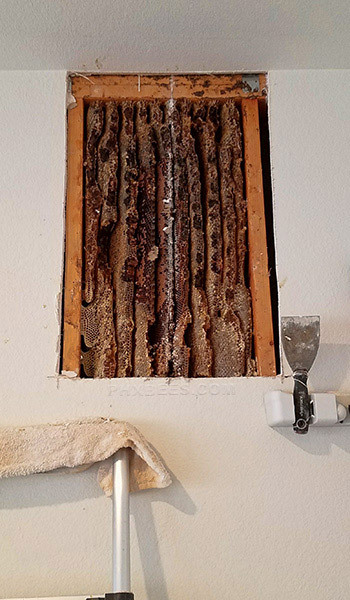 Honeycomb removal is necessary when it's in the walls to prevent property damage and fire hazards from the melting honey and electrical wiring. Bees inside of garage walls are very common in the Phoenix and Metro areas. Most garage walls in the valley are not insulated and are easy for bees to find a way inside. Sometimes it can bee through the flashing or a small hole around plumbing or electric/utility boxes. Bees inside of garage walls can also go unnoticed for long periods of time if the bees are entering in an area with less traffic. This is where some of our largest honeycomb removals have been. A tall hollow uninsulated void is the perfect spot for bees to call home and make pounds and pounds of honey. 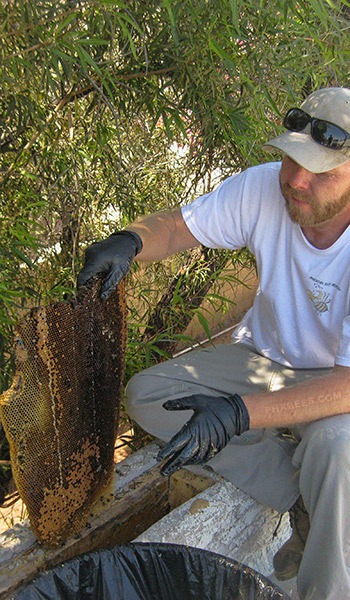 Bees making a hive underneath a shed is a big problem for a lot of residents in Central Arizona. The shed makes a perfect shelter and helps keep the bees cooler during the extreme Arizona Summer heat. Once under the shed, the bees will waste no time setting up honeycomb and multiplying. Sheds also seem to have a higher number of Africanized bees or bees that are far more aggressive. Making a shed beehive much more dangerous if you don't know the bees are under it. Removing honeycomb under sheds can vary sometimes we have to come up with unordinary solutions to get to the honeycomb. A Conex box makes a great spot for bees to call home. They are big and heavy and normally stored where there is not a lot of foot traffic. Truck drivers find a lot of hidden beehives under Conex boxes when they attempt to load them. We service a couple dozen of these types of beehives a year. We have seen entire job-sites cleared out for the day after moving Conex boxes that have been sitting for a long time untouched. Ground level bees are always more aggressive and can easily go unnoticed until it is too late and someone gets attacked. This makes bees under a Conex box a dangerous situation. Honeycomb removal is not normally done under these boxes unless a lift or crane is available nearby. 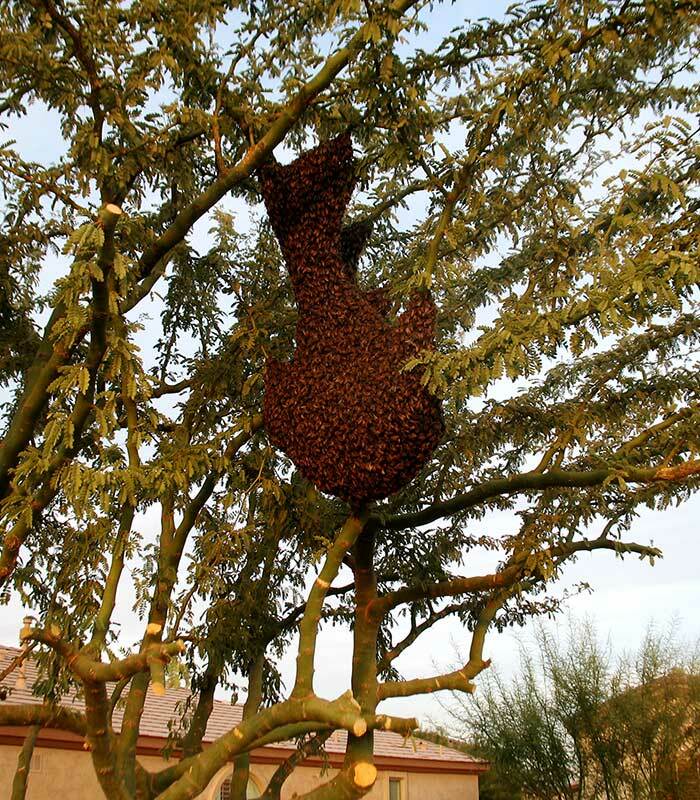 Finding an active beehive inside a valve box in Phoenix or Central Arizona is commonplace these days. These ground-level beehives can go unnoticed for long periods of time and can lead to very hostile bees. Most of the time these hives are discovered by landscapers and they know to stay away and call in a professional to remove the bees safely. Sealing in the bees or trying to flood them out will only make things worse and will not effectively nor safely get rid of your bee problem. We always advise removing the honeycomb from inside valve boxes to prevent long-term damage to the valves or wiring in the box and to also prevent other pests from being attracted to the area. Bees love to build hives inside the hollows of block walls. They make perfect bee boxes and also offer strong protection for the hive. The block fencing around backyards is notorious for housing insects of all kinds. Bees especially love these walls for providing cover from the desert elements of Central Arizona and the Phoenix Metro Area. The bees can keep the inside of the blocks nice and cool in the summer and nice and warm in the winter. This will allow uninterrupted flow for the bees to thrive in any season. Honeycomb removal from block walls is not usually necessary we have a number of solutions to prevent bees from returning to these areas. Bees will make a hive in or on just about anything if the conditions are right. Everything from birdhouses, compost bins, couches, old furniture, TV's and electronics, boats, 5th wheels, trailers, and even heavy equipment like cranes, bulldozers, and backhoes. There is never a dull moment when working with honey bees and each year we see them do something new and surprising and are constantly amazed at how creative they can bee. When it comes to honeycomb removal and repair there is not much that we have not seen but we are also amazed each year at the creativity of bees and the places they choose to build honeycomb.